ESTES PARK, Colo. – A tough tie-down roping competition just got a little tougher. Ike Fontenot made sure of it Sunday night when he roped and tied his calf in 8.3 seconds to take the lead at Rooftop Rodeo with one night remaining. The cowboy sits fifth in the race for the Resistol Rookie of the Year crown with more than $8,800 in earnings for 2016. His solid performance in Estes Park will boost his earnings some; more importantly, it provided momentum at a key part of the rodeo season. Fontenot grew up in rodeo. 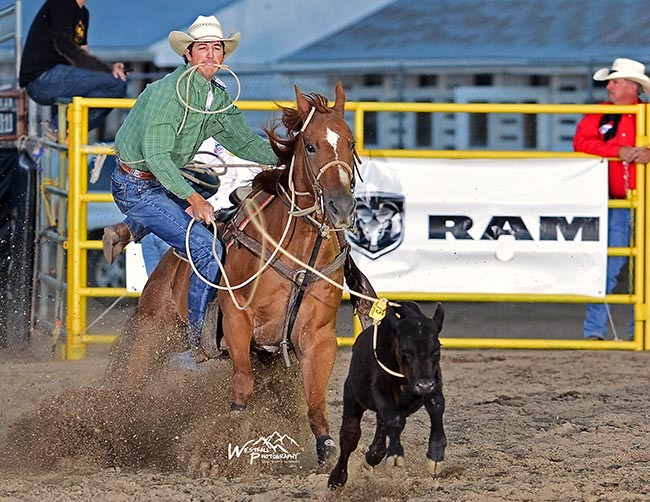 Both his parents competed, and his mother qualified for the College National Finals Rodeo. “My family was mostly team ropers, but I took a liking to calf roping because I didn’t have to depend on anybody,” he said. While this is his first year as a pro, this is his fifth year on the ProRodeo trail. He spent four years as a permit-holder because he was focusing his time on his studies and collegiate rodeo at McNeese State University in Lake Charles, La. Whether it was at the high school, college or PRCA level, Fontenot has leaned on the same partner, a 14-year-old sorrel mare. “We raised her, actually got her when she was a weanling,” he said. “We got her trained and showed her in the AQHA. She was a world champion in the quarter horse show. I’ve been riding her since she was six, and she’s 14 now. It showed in Estes Park. Fontenot moved ahead of the runners-up, Seth Hall and Ross Tucker, by three-tenths of a second, and he did it in front of another big crowd. Steer wrestling: First round: 1. Wade Sumpter, 3.8 seconds, $1,597; 2. K.C. Jones, 4.4, $1,321; 3. Cody Cabral, 4.6, $1,046; 4. (tie) Dakota Eldridge, Billy Bugenig and Josh Peek, 4.87, $514. Second round leaders: 1. Rowdy Parrott, 3.9 seconds; 2. Cole Fulton, 4.0; 3. (tie) Jarret New and Brian Snell, 4.1; 5. (tie) Josh Peek and John Franzen, 4.2. Average leaders: 1. Josh Peek, 9.0 seconds on two runs; 2. Dakota Eldridge, 9.1; 3. Jarret New, 10.3; 4. Cole Dorenkamp, 10.5; 5. Jacob Shofner, 10.7; 6. Cody Pratt, 10.8. Team roping: 1. Luke Brown/Jake Long, 4.4 seconds; 2. (tie) Cody Snow/Dugan Kelly and Colby Lovell/Travis Graves, 4.5; 4. Adam Rose/Walt Woodard, 4.6; 5. Clay Smith/Paul Eaves, 4.8; 6. Aaron Tsinigine/Kinney Harrell, 4.9; 7. Aaron Macy/Bret Tonozzi, 5.1; 8. (tie) Kolton Schmidt/Shay Carroll and Billy Bob Brown/Garrett Jess, 5.3. Saddle bronc riding 1. Hardy Braden, 84 points on Cervi Rodeo’s Hell’s Fire Hostage; 2. CoBurn Bradshaw, 82; 3. (tie) Jesse Bail and Blaze Cress, 81; 5. Jacobs Crawley, 80.5; 6. Landon Mecham, 80; 7. (tie) Tyler Corrington and Treyson Antonick, 79.5. Tie-down roping: 1. 2. Ike Fontenot, 8.3 seconds; 2. (tie) Seth Hall and Ross Tucker, 8.6; 4. Cory Solomon, 8.7; 5. Joseph Parsons, 8.8; 6. Josh Peek, 8.9; 7. Rhen Richard, 9.0; 8. Marshall Leonard, 9.1; 9. (tie) Cody Quaney and Clint Nyegaard, 9.3. Barrel racing: 1. Katie Carroll, 17.51 seconds; 2. Sherry Cervi, 17.69; 3. Trula Churchill, 17.78; 4. Heather Ratterree, 17.81; 5. McKinley Goodger, 17.85; 6. Kelly Kennedy-Joseph, 17.89; 7. Brenda McMahan, 17.91; 8. Lorie Manning, 17.94; 9. (tie) Sabra O’Quinn and Stevi Hillman, 17.95; 11. Taylor Langdon, 17.99; 12. Kayla Jones, 18.00; 13. Tori Morris, 18.03; 14. (tie) Katelyn McLeod and Ari-Anna Flynn, 18.06. Bull riding: 1. Kurtis Turner, 84.5 on Cervi Rodeos Rank Frank; 2. Derek Kolbaba, 79; 3. Dustin Muncy, 78; 4. Clayton Savage, 74; no other qualified rides.